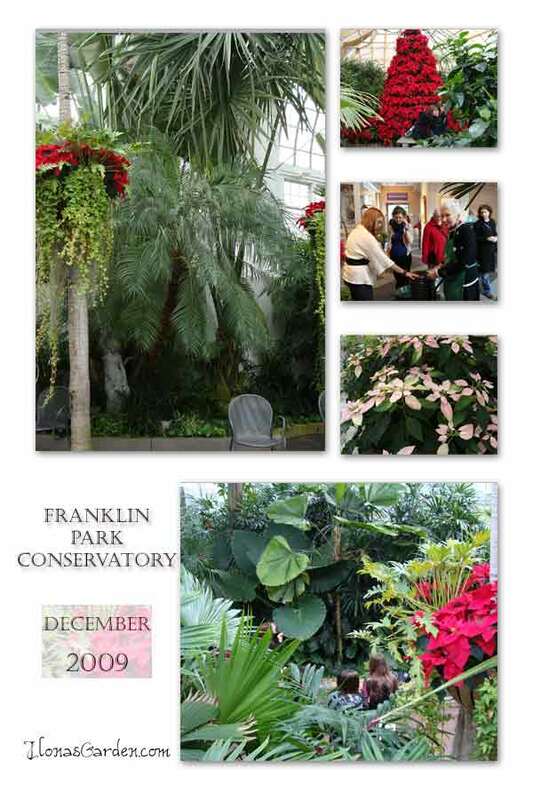 While not getting to all the events we wanted to this Holiday season, we did manage an after Christmas trip to the Franklin Park Conservatory. 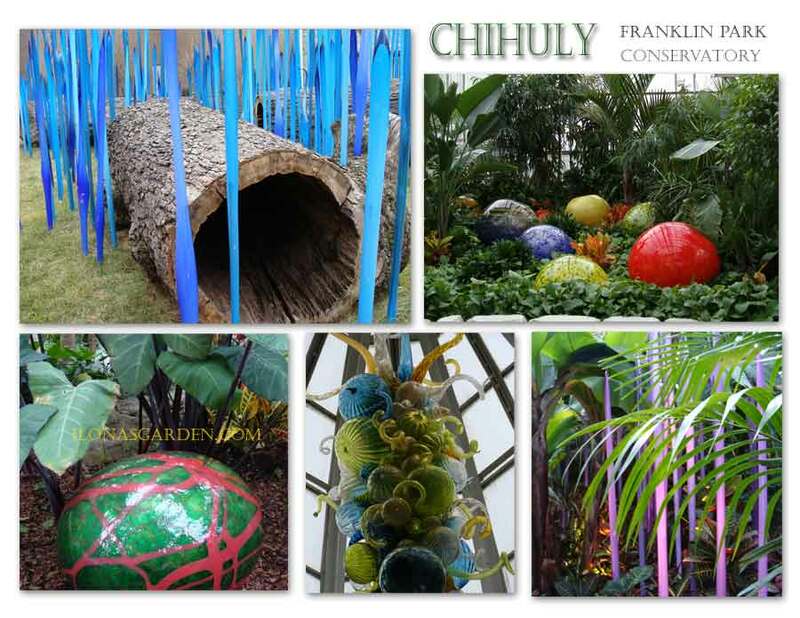 I have a number of picture posts to make, but the first thing I wanted to highlight was the medley of art glass and botanical beauty that is so well melded in the Chihuly exhibitions that Franklin Park Conservatory presents. I think this is the perfect winter mix, and complements the fun Butterfly exhibit during the warmer months. 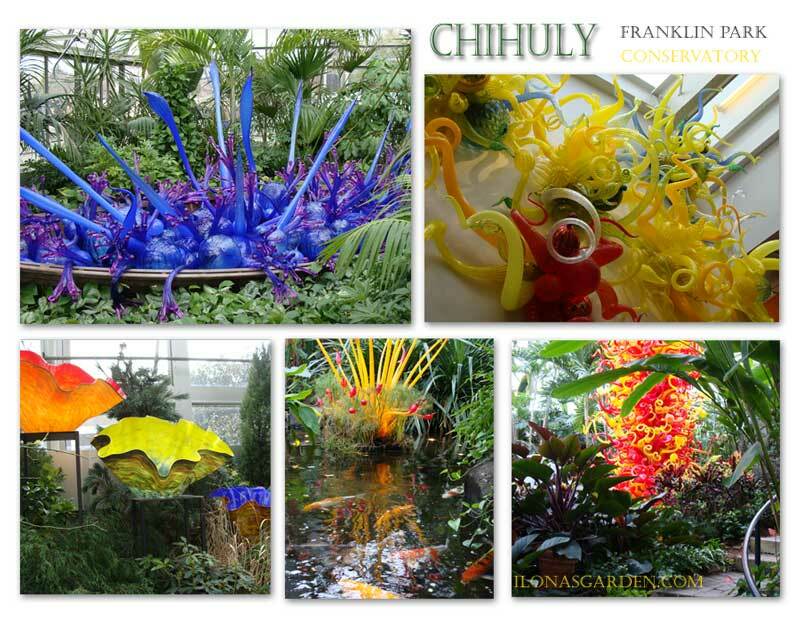 These glass sculptures are like tropical flowers bursting forth from the foliage and lend excitement to already fascinating plantings throughout the Conservatory’s Victorian Palm House, Orchid house, and global climate zone areas (although there are plenty of other sculptures tucked here and there and powerfully displayed in the main court). More about Franklin Park Conservatory at their website. 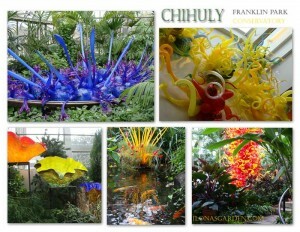 The Chihuly exhibit continues through March 28, 2010. 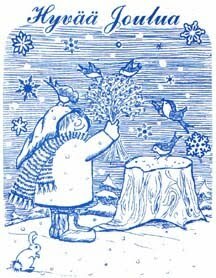 After Christmas day rains, we again had snowfall and the ground and trees were trimmed with a confectioners icing of powdered snow. It sifted down and clung to all the branches with little puffs in the crooks and crannies of the shrubs. Since most of that took place in the night hours I took no new pictures of it. but thought I would post more of the early morning photos from the first lot. 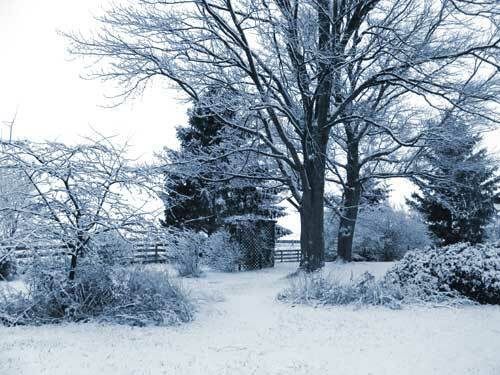 Snow actually protects the garden from the cold, and especially from the drying effects of a cold wind. It is an excellent insulator. Snow increases the temperature at soil surface by about 2 degrees for every inch of accumulation, according to the Purdue University extension service. As the snowflakes pile on top of one another, pockets of air are left between them and it is this air that provides the insulating effect. Snow not only protects from the drying winds, but it brings needed moisture to plants that will continue to lose moisture through their branches, both evergreen and leafless. And, of course, melting snow feeds the soil, carrying nutrients and moisture. She also highlighted one of Kylee‘s pictures, with exceptional winter garden color from red osier dogwood and a spiky Yucca filimentosa. I don’t usually like yucca plants in Ohio- but I like Kylee’s. I think it is in how plants are used that creates the difference. I love her combination of dogwood with it. The snow is already starting to melt- I wonder if that insulating effect of snowflakes also works as they are falling through the air? I had fun following tracks around my yard when out taking some photos. I see that deer are visiting. Not sure I like that- as they can do so much damage. I hope my husband fixes my greenhouse soon. The last windstorm blew out some pannels and they were damaged. We are waiting on replacements. I lost some plants I was storing in there. Every season has its busyness, but holiday preparing and plans always seem to compound it for December. 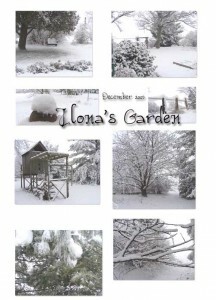 The garden waits quietly for me- I still spend some time on it but it moves far down the task list this month. This season there are different birds in the garden, and it can be fun to have feeders in order to watch them more closely. for some birds, especially later in the winter, feeding stations provided by their human friends can make a difference in their welfare. I have been creating the Advent Blog Calender posts, but will continue posting here (on a slower basis than most months). There is a great deal going on in the gardening world. I partnered with a company that supplies products for this, and they have some special offers running that might be useful to you readers. Wild Ones lists many more. Visit their page. * Hackberry (Celtis occidentalis), primarily southern Wisconsin – 24 species eat the fruit; particularly liked by Northern Flicker, Northern Mockingbird, Swainson’s Thrush and Northern Cardinal. * Eastern Red Cedar (Juniperus virginiana), primarily southern Wisconsin – 54 species have been noted eating the fruit, including Cedar Waxwing, Northern Mockingbird, Brown Thrasher, and Gray Catbird. * Hawthorns : Cockspur Hawthorn (Crataegus crus-galli) , southeastern Wisconsin; Downy Hawthorn (C. mollis) and Dotted Hawthorn (C. punctata) – Hawthorns can attract more than 20 species and are especially favored by Cedar Waxwing, Fox Sparrow and Ruffed Grouse. 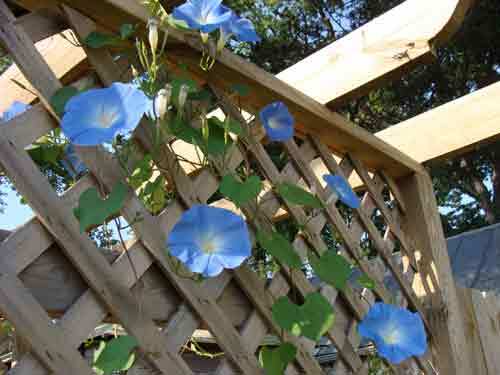 Also, they offer great cover and protection for nesting, due to their thorns. * Winterberry, (Ilex verticillata ) – Fruits eaten by songbirds, winter waterfowl, and upland game birds. * Smooth Sumac (R. glabra) – At least 3l species eat the fruits, especially the Gray Catbird, Wood Thrush,and Eastern Bluebird. * Staghorn Sumac (R.. hirta; typhina) – 21 species eat the fruit , including Red-eyed Vireo and American Robin. * Swamp Rose (R. palustris) – Its rose hips are eaten by at least 20 species and are preferred by Swainson’s Thrush and Cedar Waxwing. * Prairie Wild Rose (R. arkansana) – At least 38 species feed on its hips, including Northern Cardinal and Brown Thrasher. …much more info for year-round is included on their page. You might like to visit my past posts, viburnums and Dent de Lion among other topics. 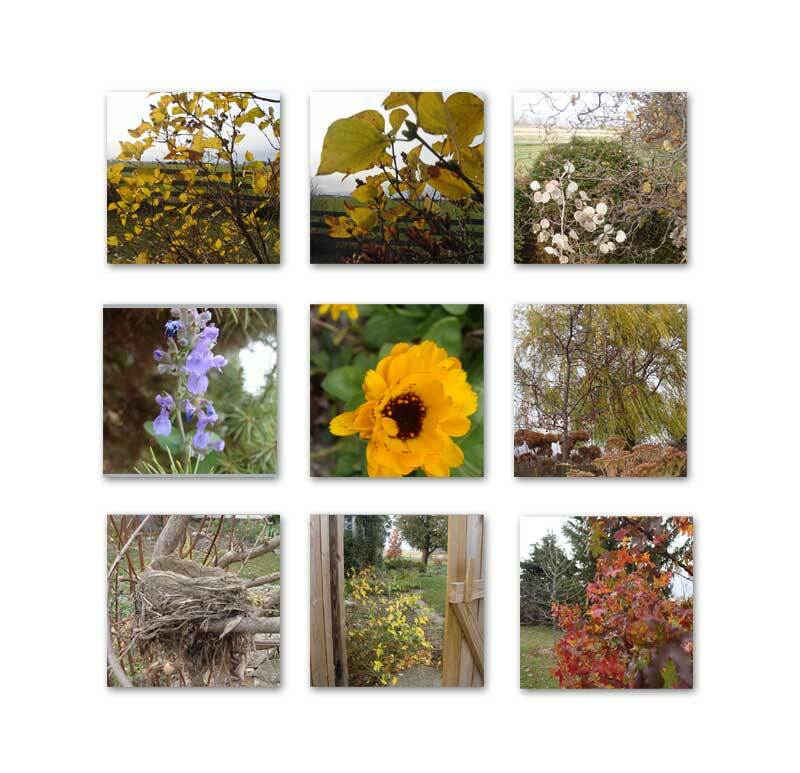 Here are some photos in a plain collage, the only common feature is that they are from my garden and taken after frosts have visited. Now, fun question. Can you guess what the golden leaved shrub is called,(pictured in the top middle and top left photos)? The reason I wonder is [hint] because so often it is censured as “dull” and without much seasonal interest. Well, now that I have photographic proof, I beg to differ. That shrub is a Syringa vulgaris, believe it or not. Although many of my lilacs are not as brightly colored in fall as this one – it still proves that they can deliver some fall color, and pruned well, they are something of a feature…besides their incomparable fragrance and fine spring flowers. there. I am now uncloseted, a veritable lilac lover. Top right the globe arborvitaes are seen through a veil of twisted Harry Lauder’s Walking Stick branches, Corylus avellana ‘Contorta’, with a sprig of lunaria seed, Moneyplant. Middle left is the diehard survivor, Nepeta mussinii, living close to the ground with its soft lavender bloom. I unmercifully sliced off all its brethren’s heads for winter. Call me Queen of Hearts. Middle middle is my self seeded calendula. This is what they look like if self seeded, not the full petaled pastel confections of the hybrids. I also have bright orange in the same form, semi-double. They seem to come alive after frosts, but I remember how unpleasant it is to have to pull their carcasses from the frozen ground at the turn of the year. And so, force myself to pull them earlier, while they still are giving last gasps of color to my garden. Isn’t this Pot marigold pretty? I’ve never tried the petals in stews, but my Kitchen garden book says they were commonly used in Medieval English cookery. The far right middle is the tardy fall color of the weeping willow, Salix babylonica. She sings “Don’t Cry for Me, Argentina” to the wind as she only now loses her leaves while they turn a final gold-yellow. Now I will have to run the leaf vacuum again since she is singing the finale of the season with the sweet gum nearby. All the other trees have packed up and taken sabbatical for the winter.The photo angle catches the Annabelle and sedum flower heads. Hidden in the Dawn viburnum, I had no idea this bird’s nest was here…almost at eye level for me. Bursts of sparrows from my pyracantha every time I walk nearby leave no doubts about their whereabouts, however. Bottom left. Bottom middle, is the spray of yellow leaves from the kerria japonica. I have the single blossom type, which I prefer. It has bright green stems all winter. Bottom right, the sweet gum still bright and actually turning kaleidoscope variations of red, orange, purple. A Harlequin that holds leaves for an absurdly long time. I don’t write poetry very often… it takes decades to pry one out of me that I think is half decent in relaying my feeling in something that I also consider art. However I did write one that I posted back in January. Winter’s Meeting. Joanne is the resident bard… and I thought maybe she would like to read it. This is the Gardener’s Year in Review…probably the one thing in which we gardening enthusiasts are a step ahead of the rest of the world: review the year in November. This year saw two new additions to my garden: the greenhouse, and a rain barrel. Both of which I have wanted for years and years. Now that I have them I am trying to integrate them into my old dog gardener ways. The rain barrel caused a bit of disagreement between me and my husband. I want to use the rain barrel for wintertime water in the greenhouse… he is grousing about not putting the rain barrel away for the winter: “If it freezes and cracks, I am not going to buy another one”. the green house stays pretty warm over the winter… not warm enough for tropicals, but with my idea of insulating the bottom area with straw bales around the outside, it seems it could weather Ohio’s worst. So we came to a compromise of sorts. I agree to drain it out if the thermometer registers a single digit threat, with the additional parting growl of “… but you are responsible for taking care of it, I’m not going to check your greenhouse for you”. Now, I need to buy that straw. I cleared out a weedy patch from part of the bed that I let go wild with Charles de Mills Gallica roses and volunteer asters. The asters showered me with their tiny feathery seeds, and Charles prickled right through my leather garden gloves to register his displeasure. I used some of the free mulch to give a cloak of civility to the wild bed for winter’s sake. This same bed holds the contorted hazel, which once divested of the underbrush of asters and rose canes showed it once again needed some watersprouts pruned out. So I obliged. I saved the straight canes in a place beside the green house where my imagination has me weaving some twiggy supports during winter weekends sheltered in my cozy greenhouse. We’ll see. (I have come to use that phrase much when at the start of my mind’s eye of new ventures). I sawed off a large branch from the fringe tree to give it more of a tree form than the wide spreading, half shrub shape it often takes. I cut larger branches with some trepidation that somehow I might be maiming it for posterity, but it looked better to my eye, so no harm done. A few leftover daylilies were tucked in, while I saved the major pruning to the old lilac for another day. Today the soft rains came. And so it goes – my soul finally feeling rest that my most pressing work was done, a few extra improvements made, and a look forward to what is possibly one my favorite pastimes: garden planning for the next year. I have a few pictures yet to share with you, my dear readers, and tucked into the back pocket of my mind are rural ruminations, although I need a good camera day for pictures to partner with the thoughts. Til then, friends- peace and contentment along with a grateful spirit.